^ De Witte, Ludo (January 9, 2016). 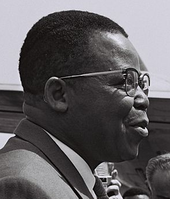 "Congolese oorlogstranen: Deportatie en dwangarbeid voor de geallieerde oorlogsindustrie (1940-1945)". DeWereldMorgen.be. Retrieved 17 March 2018. Cana, Frank Richardson (1922). "Belgian Congo" . In Chisholm, Hugh. Encyclopædia Britannica. 30 (12th ed.). London & New York. p. 429. ^ Hunt, Nancy Rose (2002). "Rewriting the Soul in Colonial Congo: Flemish Missionaries and Infertility" (PDF). Netherlands Institute for Advanced Study in the Humanities and Social Sciences. 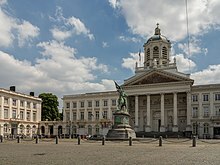 Antwerp University Institute for Advanced Study in the Humanities and Social Sciences. Archived from the original (PDF) on 2004-06-13. ^ "CONGO: Boom in the Jungle" (PDF). Time. 16 May 1955. ISSN 0040-781X. Retrieved 2017-10-28. Lay summary. ^ "BELGIAN CONGO;: Too Late, Too Little?" (PDF). Time. 23 December 1957. ISSN 0040-781X. Retrieved 2017-10-28. Lay summary. ^ "BELGIAN CONGO: If Blood Must Run" (PDF). Time. 19 January 1959. ISSN 0040-781X. Retrieved 2017-10-28. Lay summary. 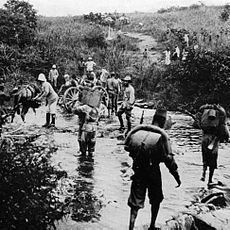 ^ "THE BELGIAN CONGO: Return of the Mundele" (PDF). Time. 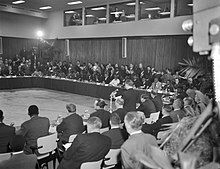 12 October 1959. ISSN 0040-781X. Retrieved 2017-10-28. Lay summary. 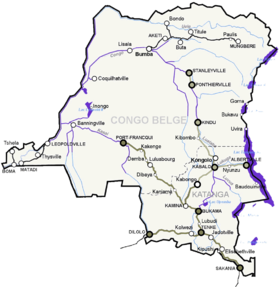 ^ "BELGIAN CONGO: Now Now Now" (PDF). Time. 16 November 1959. ISSN 0040-781X. Retrieved 2017-10-28. Lay summary.